Check out our LiveSlide Presentation here. 37. Vinaykin, M.; Benderskii, A. V. "Orientational Dynamics in Sum Frequency Spectroscopic Line Shapes" J. Phys. Chem. B 2013, 117, 15833-15842 - M. D. Fayer Festschrift. 36. Valley, D.T. ; Onstott, M.; Malyk, S.; Benderskii, A. V "Steric Hindrance of Photoswitching in Self-Assembled Monolayers of Azobenzene and Alkane Thiols" Langmuir 29, 11623–11631 (2013). 35. Dhar, P.; Khlyabich, P. P.; Burkhart, B.; Roberts, S. T.; Malyk, S.; Thompson. B. T.; Benderskii, A. V "Annealing-Induced Changes in the Molecular Orientaiton of Poly-3-hexylthiophene at Buried Interfaces" J. Phys. Chem. C 117, 15213-15220 (2013). 34. Malyk, S.; Shalhout, F. Y.; O'Leary, L.E. ; Lewis, N.S. ; Benderskii, A. V "Vibrational Sum Frequency Spectroscopic Investigation of the Azimuthal Anisotropy and Rotational Dynamics of Methyl-Terminated Silicon(111) Surfaces" J. Phys. Chem. C 117, 935-944 (2013). 33. Vinaykin, M.; Benderskii, A. V. "Vibrational Sum-Frequency Spectrum of the Water Bend at the Air/Water Interface" J. Phys. Chem. Lett. 3, 3348–3352 (2012). 32. 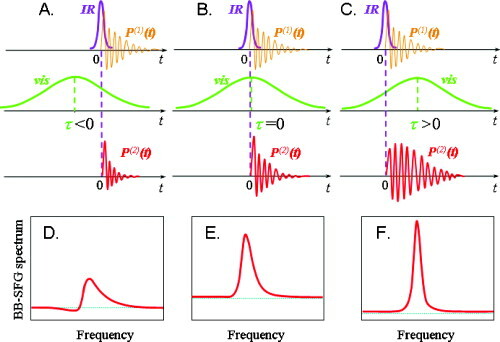 Shalhout, F. Y.; Malyk, S.; Benderskii, A. V. "Relative Phase Change of Nearby Resonances in Temporally Delayed Sum Frequency Spectra" J. Phys. Chem. Lett. 3, 3493–3497 (2012). 31. Stiopkin, I. V., Weeraman, C.; Pieniazek, P.A. ; Shalhout F.Y. ; Skinner J. L.; Benderskii, A. V. "Hydrogen Bonding at the Water Surface Revealed by Isotopic Dilution Spectroscopy" Nature 474, 192-195 (2011). 30. Stiopkin, I. V., Jayathilake, H. D.; Benderskii, A. V. "Temporal Effects on Spectroscopic Line Shapes, Resolution, and Sensitivity of the Broad-Band Sum Frequency Generation" J. Chem. Phys. 132, 234503, 1-9 (2010). 29. 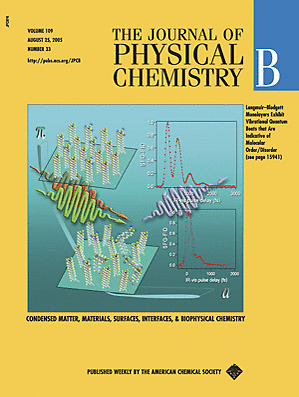 Jayathilake, H. D.; Driscoll, J.; Bordenyuk, A. N.; Wu, L.; da Rocha, S. P. R.; Verani, C. N.; Benderskii, A. V. "Molecular Order in Langmuir-Blodgett Monolayers of Metal-Ligand Surfactants Probed by Sum Frequency Generation" Langmuir 25, 6880-6886 (2009). 28. Yatawara,A. K.; Tiruchinapaly, G.; Bordenyuk, A. N.; Andreana, P. R.; Benderskii, A. V. "Carbohydrate Surface Attachment Characterized by Sum Frequency Generation Spectroscopy" Langmuir 25, 1901-1904 (2009). 27. Palyvoda, O.; Bordenyuk, A. N.; Yatawara,A. K.; McCullen, E.; Chen, C.-C.; Benderskii, A. V.; Auner. G. W. "Molecular Organization in SAMs Used for Neuronal Cell Growth" Langmuir 24, 4097-4106 (2008). 26. Stiopkin, I. V., Jayathilake, H. D.; Bordenyuk, A. N.; Benderskii, A. V. "Heterodyne-detected Vibrational Sum Frequency Generation Spectroscopy" J. Am. Chem. Soc. 130, 2271-2275 (2008). 25. Bordenyuk, A. N.; Weeraman, C.; Yatawara, A. K.; Jayathilake, H. D.;Stiopkin, I.V. ; Yu, L.; Benderskii, A. V. "Vibrational Sum-Frequency Generation Spectroscopy of Dodecanethiol on Metal Nanoparticles", J. Phys. Chem. C 111, 8925-8933 (2007) Kenneth B. Eisenthal Festschrift. 24. 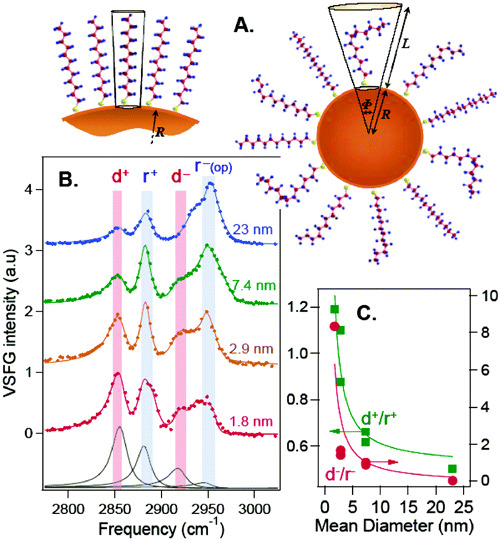 Weeraman, C.; Yatawara, A. K.; Bordenyuk, A. N.; Benderskii, A. V. "Effect of Nanoscale Geometry on Molecular Conformation: Vibrational Sum-Frequency Generation of Alkanethiols on Gold Nanoparticles", J. Am. Chem. Soc. 128,14244 - 14245 (2006). 23. Jayathilake, H. D.; Bordenyuk, A. N.; Weeraman, C.; Zhu, M.; Rosenblatt, C.;Benderskii, A. V. “Rubbing-induced Anisotropy of Alkyl Side Chains Orientation at Polyimide Surfaces”, J. Chem. Phys. 125, 064706 (2006). 22. 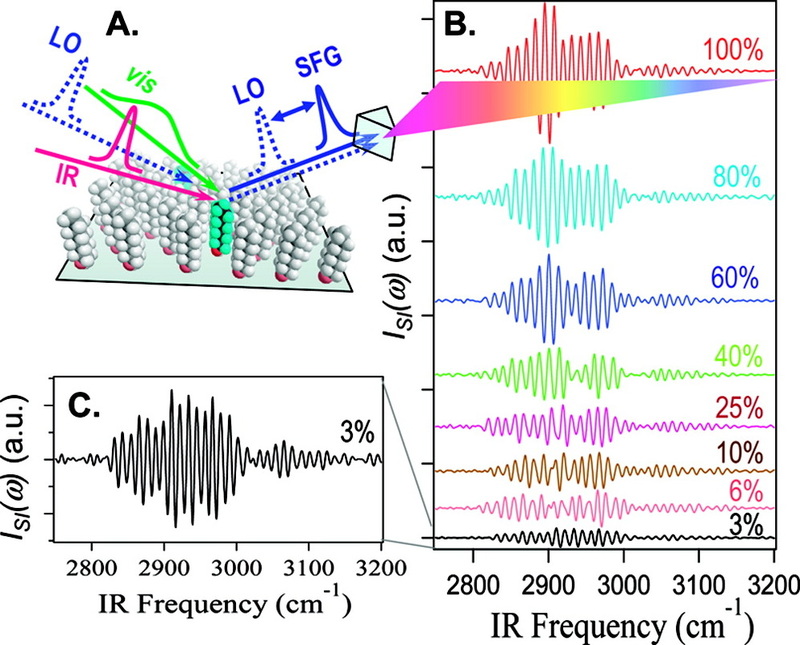 Bordenyuk, A. N.; Jayathilake, H.; Benderskii, A. V. “Coherent Vibrational Quantum Beats as a Probe of Langmuir-Blodgett Monolayers”, J. Phys. Chem.B 109, 15941 (2005). Cover illustration, vol. 109, No. 33 (August 25, 2005). 21. Bordenyuk, A. N.; Benderskii, A. V. “Spectrally- and Time-Resolved Vibrational Surface Spectroscopy: Ultrafast Hydrogen Bonding Dynamics at D2O/CaF2Interface” J. Chem. Phys. 122, 134713 (2005). Selected for publication in Virtual Journal of Ultrafast Science (May 2005 issue)and Virtual Journal of Biological Physics Research (April 15, 2005 issue). 20. Benderskii, A. V.; Henzie, J.; Basu, S.; Shang, X.; Eisenthal, K. B. "Femtosecond Aqueous Solvation at a Positively Charged Surfactant/Water Interface" Journal of Physical Chemistry B 108, 14017 (2004). 19. Benderskii, A. V.; Eisenthal, K. B. "Dynamical Timescales of Aqueous Solvation at Negatively Charged Lipid/Water Interfaces", Journal of Physical Chemistry A 106, 7482 (2002). 18. Benderskii, A. V.; Eloranta J., Zadoyan, R.; Apkarian, V. A. “A direct interrogation of superfluidity on molecular scales”, Journal of Chemical Physics 117, 1201 (2002). 17. Shang, X.; Benderskii, A. V.; Eisenthal, K. B. 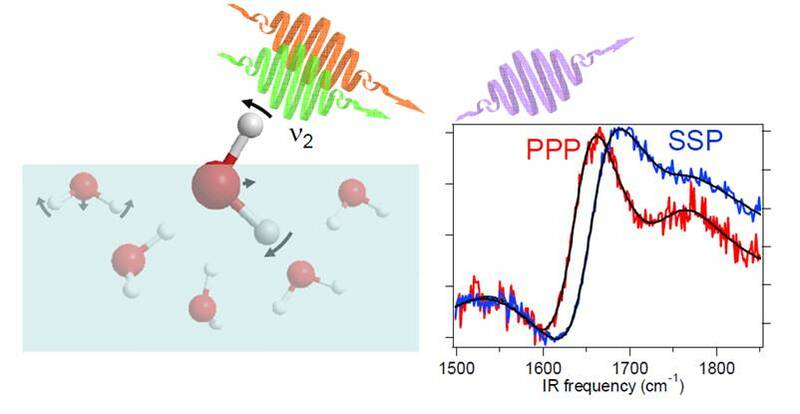 "Ultrafast Solvation Dynamics At Silica/Liquid Interfaces Probed by Time-Resolved Second Harmonic Generation", Journal of Physical Chemistry B 105, 11578-11585 (2001). 16. Benderskii, A. V.; Eisenthal, K. B. "Aqueous Solvation Dynamics at the Anionic Surfactant Air/Water Interface", Journal of Physical Chemistry B 105, 6698 (2001). 15. Benderskii, A. V.; Eisenthal, K. B. 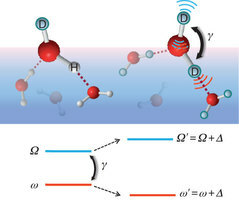 "Effect of Organic Surfactant on Femtosecond Solvation Dynamics at the Air-Water Interface", Journal of Physical Chemistry B 104, 11723-11728 (2000). Featured in “News and Views" section of Nature, 410, 645, 2001. 14. Benderskii, A. V.; Zadoyan, R.; Schwentner, N.; Apkarian, V. A. “Photodynamics in Superfluid Helium: Femtosecond Laser Induced Ionization, Charge Recombination, and Preparation of Molecular Rydberg States”, Journal of Chemical Physics 110, 1542-1557 (1999). 13. Benderskii, A. V.; Zadoyan, R.; Schwentner, N.; Apkarian, V. A. “Femtosecond Laser Excitation and Spectroscopy of Superfluid Helium”, Proceedings SPIE, Vol. 3273, p. 297 (1998). 12. Benderskii, A. V.; Zadoyan, R.; Apkarian, V. A. “Caged Spin-Orbit Excited I*(2P1/2)+I*(2P1/2) Atom Pairs in Liquids and in Cryogenic Matrices: Spectroscopy and Dipolar Quenching“, Journal of Chemical Physics 107, 8437-8445 (1997). 11. Misochko, E. Y.; Benderskii, V. A.; Goldshleger, A. U.; Akimov, A. V.;Benderskii, A. V.; Wight, C.A. “Reactions of Photogenerated Fluorine Atoms with Dopant Molecules in Solid Argon. 1. Photolysis of Solid Ar-CH4(CD4)-F2Mixtures at 13-16 K” Russian Chemical Bulletin 46, 678 (1997). 10. Misochko, E. Y.; Benderskii, V. A.; Goldshleger, A. U.; Akimov, A. V.;Benderskii, A. V.; Wight, C. A. “Reactions of Photogenerated Fluorine Atoms with Dopant Molecules in Solid Argon. 2. Reaction Of CH4 Molecules with Fluorine Atoms Diffusing in Solid Argon at 20-30 K”, Russian Chemical Bulletin46, 687, (1997). 9. Misochko, E. Y.; Benderskii, V. A.; Goldschleger, A. U.; Akimov, A. V.;Benderskii, A. V.; Wight, C. A. “Reactions of Translationally Excited and Thermal Fluorine Atoms with CH4 and CD4 Molecules in Solid Argon”, Journal of Chemical Physics 106, 3146 (1997). 8. Benderskii, A. V.; Wight, C. A. "Conformational Isomerization of 1,2-Difluoroethane in Solid Argon: Cage-Modified Reaction Barriers", Journal of Physical Chemistry 100, 14958 (1996). 7. Misochko, E. Y.; Benderskii, A. V.; Wight, C. A. "Formation of b-fluoroethyl Radical and Closed-Shell Products in Reactions of Photogenerated F Atoms with Ethylene in Solid Argon", Journal of Physical Chemistry 100, 4496 (1996). 6. Benderskii, A. V.; Wight, C. A. "Diffusion-limited Recombination of O+O2 in Solid Xenon", Journal of Chemical Physics 104, 85 (1996). 5. Benderskii, V. A.; Benderskii, A. V. Laser electrochemistry of intermediates, CRC press (1995). 4. Benderskii, A. V.; Benderskii, V. A.; Krivenko, A. G. "Photocurrent Kinetics for the Electron Emission from Metal into Electrolyte Solution", Journal of Electroanalytical Chemistry 380, 7 (1995). 3. Benderskii, A. V.; Wight, C. A. "Photolysis of Ozone and Reactions of O(1D) Atoms in Solid Nitrogen", Chemical Physics 189, 307 (1994). 2. Benderskii, A. V.; Wight, C. A. "Photochemistry of Ozone in Solid Mixtures with Argon", Journal of Chemical Physics 101, 292 (1994). 1. Benderskii, A. V.; Mattis, D. C. "Simple Toy Model of Superconductivity",Modern Physics Letters B 8, 617-627 (1994). J. Phys. Chem. C 117, 15213-15220 (2013). Our study of the spectral line shapes of the "free OD" mode at the air/water interface performed using broad-band heterodyne-detected sum frequency generation spectroscopy reveals that the H-bonding in the top-most layer of water molecules at the surface is only slightly weaker than bulk water H-bonds. See "News and Views" feature by Pavel Jungwirth in Nature 474, 168–169 (2011). Relative phase change of nearby resonances in JPC Lett. A detailed treatment of the spectral line shapes in BB-SFG (broad-band sum frequency generation) spectroscopy has appeared in JCP. 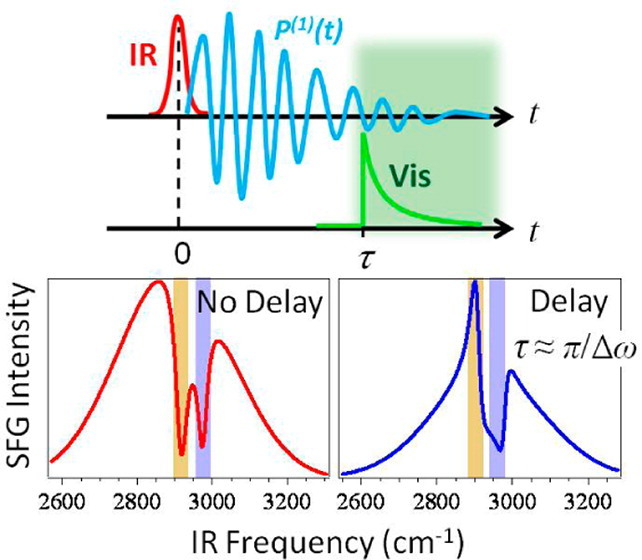 In particular, the paper deals with the effects of the time delay between the IR and visible pulses on the obtained line shape.